Decor Scene - Your Local DIY Store. Décor Scene is a well established family run business which was formed in 1966. The business was taken over in 1986 by Mr Thomas Paul Charnock and his father Thomas Charles Charnock, Today the business is flourishing with Thomas Paul still in charge with son Michael managing the business. Located just outside Rickmansworth town centre, with over 10,000 product lines, we are known as the Aladdin’s cave in painting and decorating. Since we were formed in the mid sixties, Décor Scene has always met its customer’s needs through carrying such an extensive range of stock. If we don’t have what the customer is looking for we will order it in for them. 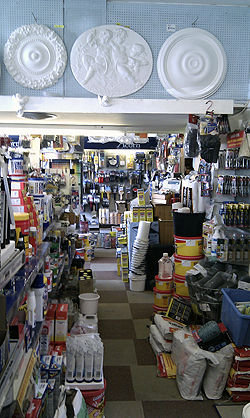 Our huge range in D.I.Y goods is always growing, in line with customer demand for ever more products. At Décor Scene we offer a one on one service to all our customers, which you cannot expect in B&Q or Home base. We always make sure that we leave all our customers feeling happy and satisfied with their purchase. At Décor Scene we also offer a decorating service which is managed by the family within the business so don’t be afraid to ask for a free quote.